Positive: Low price; decent hardware; big screen. Model: A lot of budget gaming laptops seem to be making great impacts on the portable computer market. Even non-gamers love this genre of laptops as the specifications are generally great for semi-professionals who are into process-heavy tasks like video and image editing. 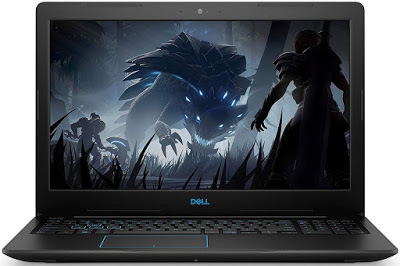 There is a new budget gaming laptop making its round in the market, and that is the Dell G3 15 3579-CN35711. This 15.6-inch budget gaming laptop has quite a lot going for it. It is equipped with an Intel Core i5-8300H, a processor from the upper-middle Intel Coffee Lake range. The processor has four processors that clocks at a frequency of 2.3 GHz to 4.0 GHz. It also has eight logical threads with 8 MB of cache. Professional users will be happy to know that the processor is suitable for heavy processes like video and image editing. Since the Dell G3 15 3579-CN35711 is marketed as a gaming laptop, it is expected for it to come with a good graphics card. It is no surprise that the laptop is equipped with an Nvidia GTX 1050 graphics card with a built-in 4 GB of DDR5 VRAM. This may be an entry level graphics card, but it is sufficient to run new and modern games in, at least, a medium setting. To complement the graphics card, Dell has equipped the laptop with a gorgeous IPS panel that has a resolution of 1,920 x 1,080 pixels and a matte finish. For users who prefer better screens, there is also an option to connect to a 60 Hz 4K monitor via the HDMI 2.0 port. Another great news for modern-day laptop users is that Dell has decided to include a 128 GB SSD drive in addition to the usual 1 TB hard disk drive. Thanks to the SSD, users can now opt to put the operating system on the much faster SSD drive. The Dell G3 15 3579-CN35711 also comes with 8 GB of DDR4 RAM, which should be sufficient for most users.Those who prefer a bigger RAM capacity may opt to add another memory stick to the second slot in the motherboard. And now, let’s move on to the connectivity and ports that come with the laptop. The Dell G3 15 3579-CN35711 comes equipped with two USB 3.1 ports and one USB Type-A port, but sadly, no USB Type-C is added to the laptop. There is also one HDMI 2.0 port (as mentioned previously), an Ethernet port, one SD memory card slot, and one audio/mic combo jack. As per the norm with modern laptops, it also has a web camera for video conferencing. Measuring at 22.7 x 380 x 258 mm and weighing at about 2.5 kg, the Dell G3 15 3579-CN35711 doesn’t have a lot of advantage over the other smaller and thinner laptops in the market. But for those who do not mind the little extra weight that this laptop comes with, it makes an excellent buy at this price point.